The 2013 EICMA show announcements are rolling in, and Honda has returned to the single platform, multiple models approach that appears to working so well with the CB500 series. Give a hearty welcome to the 2014 Honda CB650F and CBR650F. As you might expect from the CB and CBR designations, one is a naked bike and the other a sporty one. 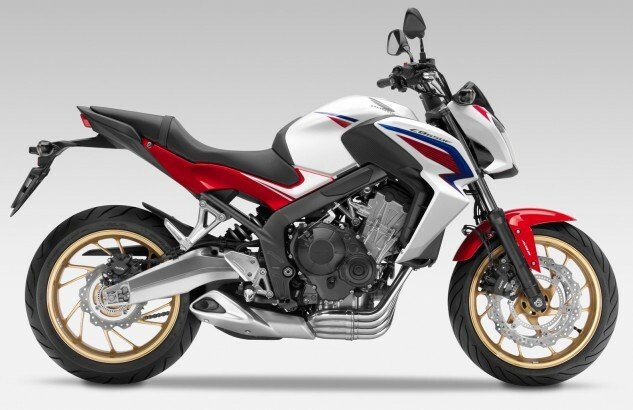 Focusing on what they hope will appeal to younger riders, Honda’s engineers set out to create a chassis and engine combination that would strike the right balance between sportiness and practicality. The 649cc inline-Four was designed to be compact with a forward cant of 30 degrees. Operating within a bore and stroke of 67mm x 46mm, the con-rod length is designed to decrease the side-forces on the pistons. Pumping losses are reduced via vent holes through the crankcase walls between the journals. The pistons themselves wear asymmetric skirts to limit friction through reduced bore contact. The outer surface of the cylinder sleeves received ferrous spines as a means of reducing oil consumption and optimizing heat dissipation. The 16 valves are directly operated by DOHC. The cams are, in turn, rotated by a friction reducing, silent SV cam chain. The timing is set for real world drivability and torque below 4000 rpm. A claimed peak of 85.8hp arrives at 11,000rpm while peak torque weighs in at 46.5 ft-lb at 8000. Exhaust gasses exit through a 4-into–2-into–1 catalyzer-equipped exhaust located under the right side of the swingarm. Fresh air travels from the airbox through 30mm “high-velocity funnels” while fuel metering is accomplished with PGM-FI delivering commands to the Keihin KN7SJ injectors in the 32mm throttle bodies. All four cylinders get their own throttle body sensors for more accurate fuel delivery and better throttle response. A short valve overlap and a special ignition map improves high-speed, constant throttle economy and assists the 650 in achieving a claimed 217-mile range. Factoring for a 4.6 gallon tank reveals a claimed 47.2 mpg. The aesthetics and compactness of the engine are aided by the use of internal water channels from the head past the cylinders. The engine’s space requirements are further reduced by the stacked six-speed gearbox and starter motor. The chassis is constructed from twin 64mm x 30mm elliptical spars. To achieve the correct rider feedback and handling character, Honda tuned the flexibility of the frame for stiffness around the headstock with more flex in the spar sections. A sporty rake of 25.5° and 4.0 in. of trail are mated to 57.1 in. wheelbase, pointing to a bike that should feel light and maneuverable – particularly when the 465 lb. wet weight is factored in. The traditional 41mm fork is non-adjustable while the shock gets seven-position adjustable preload. The shock mounts directly to the die-cast aluminum swingarm. Radial 120/70–17 and 180/55–17 tires are mounted on five spoke, cast aluminum wheels. Two-channel ABS is standard. To simplify manufacturing, the 240mm rear disc is cut from the inside of the 320mm front disc. 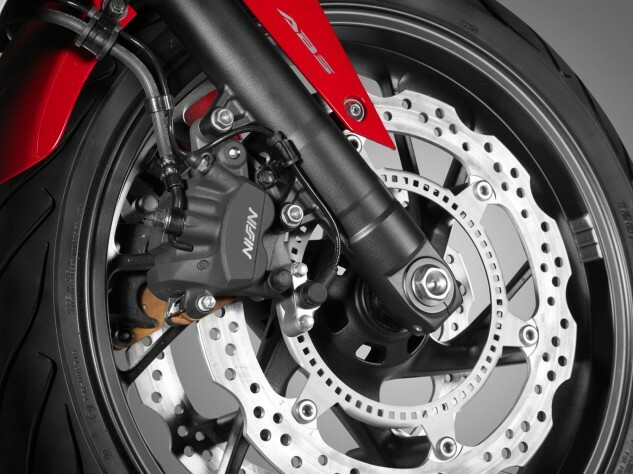 The dual front discs are squeezed by dual-piston calipers and sintered metal pads. The rear receives a single-piston caliper and resin mold pads. With a base chassis apparently produced with real-world use in mind, the differences between the CB650F and the CBR650F are few but still important. 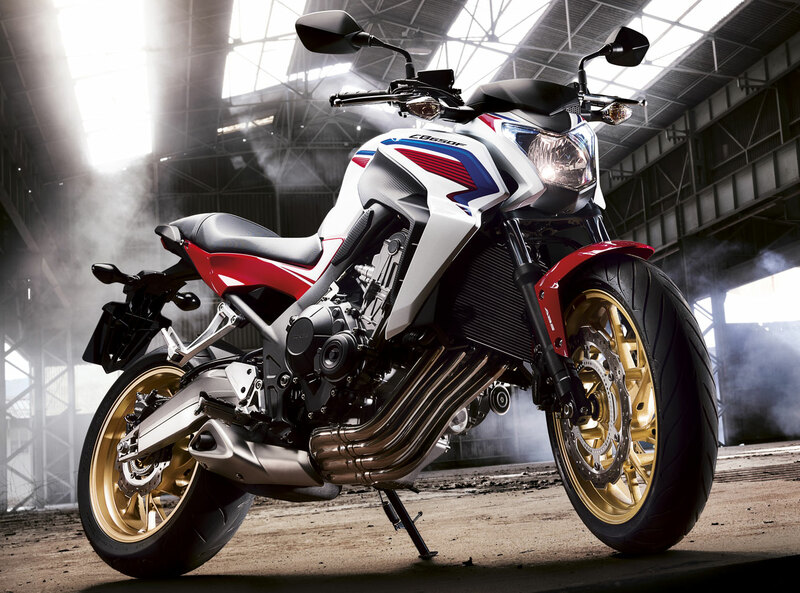 First, the CB650F features minimal weather protection aside from the slick-looking headlight nacelle. The CBR650F has suitably sporty full-coverage bodywork. Riding positions are different in the expected ways. The CB has an upright riding position with a wide tubular handlebar for maximum leverage. 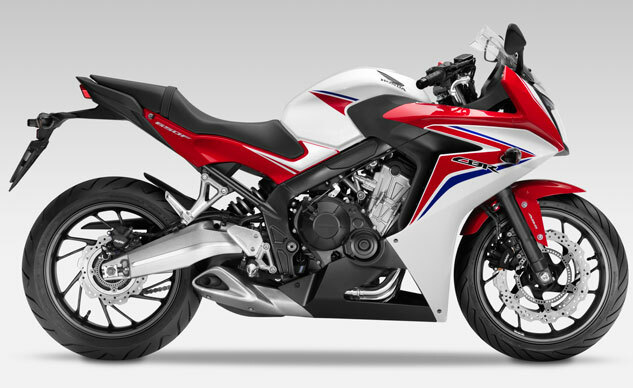 The CBR, on the other hand, has a more sporty forward lean that puts the rider in a more aggressive position. 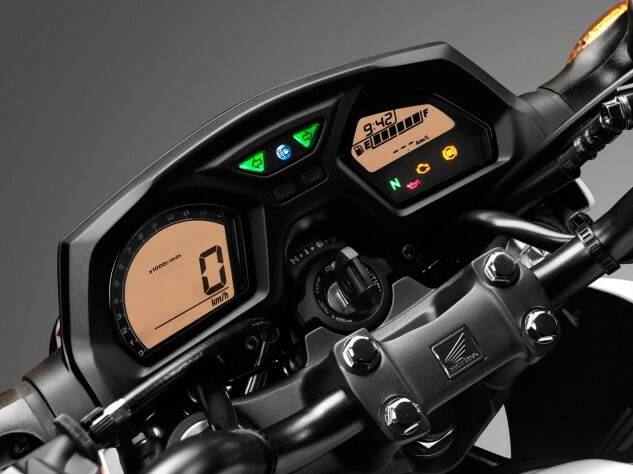 The suspension settings are similarly differentiated between the two motorcycles. The CBR receives firmer spring rate and damping for a more sporting ride. Despite suspension differences, the seat height for both motorcycles is 31.9 in. 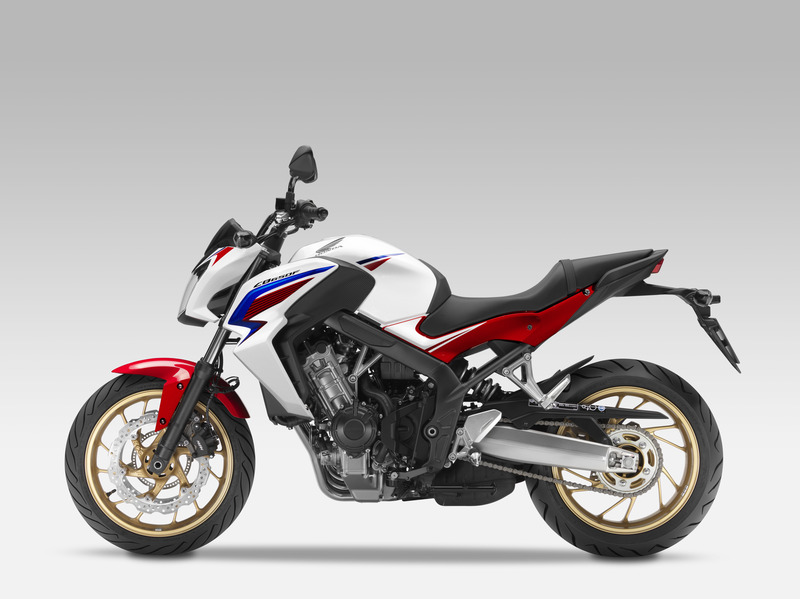 These two motorcycles illustrate Honda’s further commitment to producing multiple models from the same base chassis as a means of maintaining manufacturing costs while still providing performance, styling and technology that appeals to riders. While we are disappointed that these two models are not slated to arrive stateside in 2014, we can always watch – and hope.